Question 8/ Day 8 - am I aware of the shadows and contrast? Whether you have your camera with you or not, the only way to learn about light is to observe it constantly. Harsh light intensifies the contrast between light and shadows and can be quite unflattering. When you make images in harsh sunlight your subject often ends up with shadowy eye sockets that make them look tired. When working with diffused less intense light, contrast is lower and the light is more flattering. The image below was made at Angkor Wat temple in Cambodia. Subjects stand out prominently when colors are utilized to differentiate them from the background. 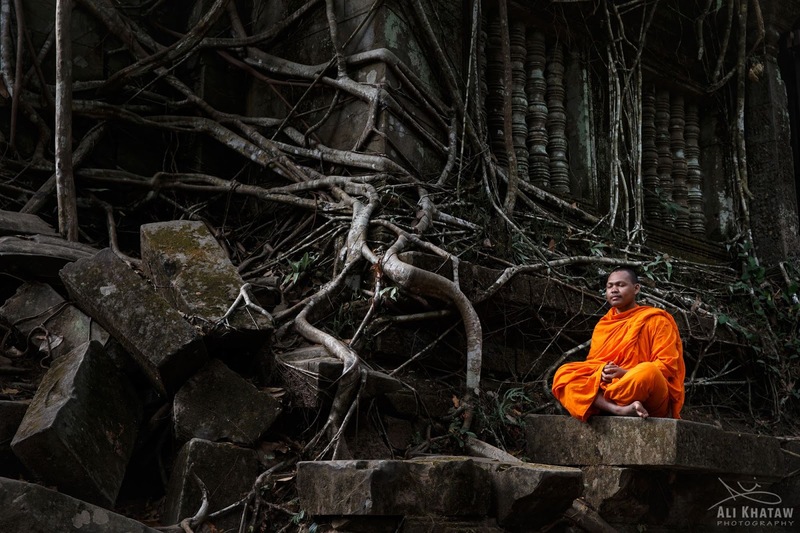 I asked a local monk to sit on one of the rocks where the ruins and the old tree roots had created a beautiful abstract background. I utilized the rule of thirds to compose and the resulting image below was created. I named it “Peace within Chaos”. Hope you found this helpful! Stay tuned for tomorrow when we will discuss “CONTRAST - HARD LIGHT & SOFT LIGHT"